on a much lighter note . . .
Just want to say you can have your middle fingernail torn three-fourths of the way off, and have it dangling and jagged and pretty much a goner and still save it! 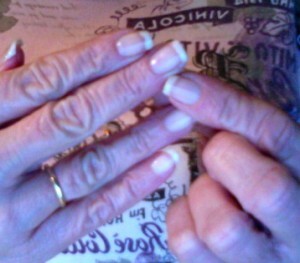 The last couple of weeks I have been super-gluing it back to itself, both over and under the nail. Then I file the glue until it’s nice and smooth and polish it with a pink polishing file, then paint it like the rest of them and you’d never know I was swearing about this nail two hours earlier! Yes, I did say sugar dia-beatrice at least eight times today. I was so afraid I would accidentally snag it all the way off before I could get home to my trusty new best friend. . . Super Glue!